How important is managing culture change in a digital transformation? By the size of the "packed room" at Gartner's session on "How to create a culture that is ready for anything", at least CIO have recognized how critical it is to either own or be a part of an organization's cultural changes. 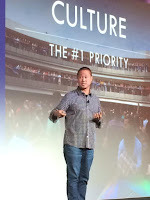 Culture change is about educating people on how to "live differently" and to be cross-fit to handle any number of new, disruptive, or even volatile situations. An "Ironman culture" addresses how we make decisions, engage coworkers, customers and suppliers, how we measure outcomes and how we work. Culture changes cannot be done in one "big bang" and must be done incrementally. Establishing agile practices, cleaning up meetings, and developing other rituals are all tools to enact culture change. Today's culture requires more people becoming "hands on". The business isn't going to transform by developing presentations or spreadsheets. What are the value pillars of your culture change? Is it driven by business analytics and becoming a data driven organization? Is it done through community activities (Zappos downtown project)?